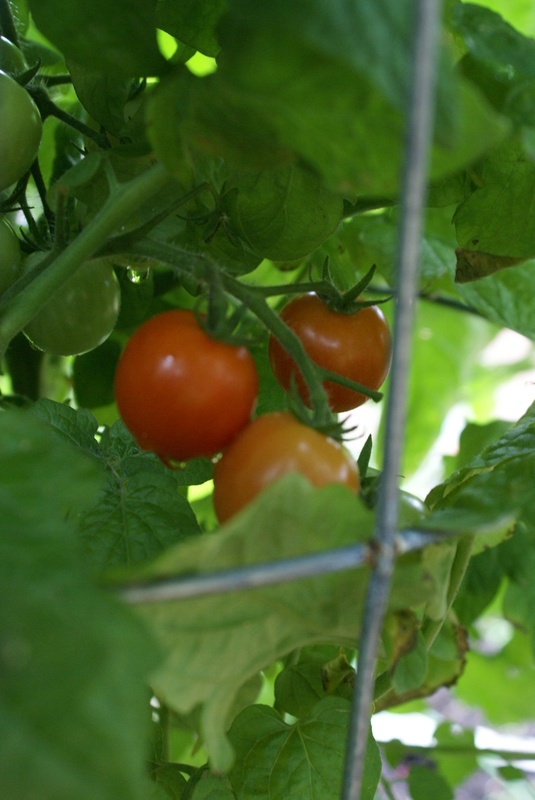 When I lifted up the lower branches to check on my “first” set of cherry tomatoes, I discovered they are turning red! My other “large” heirloom tomatoes are also starting to turn red…they’re sorta an orange-y brown color. 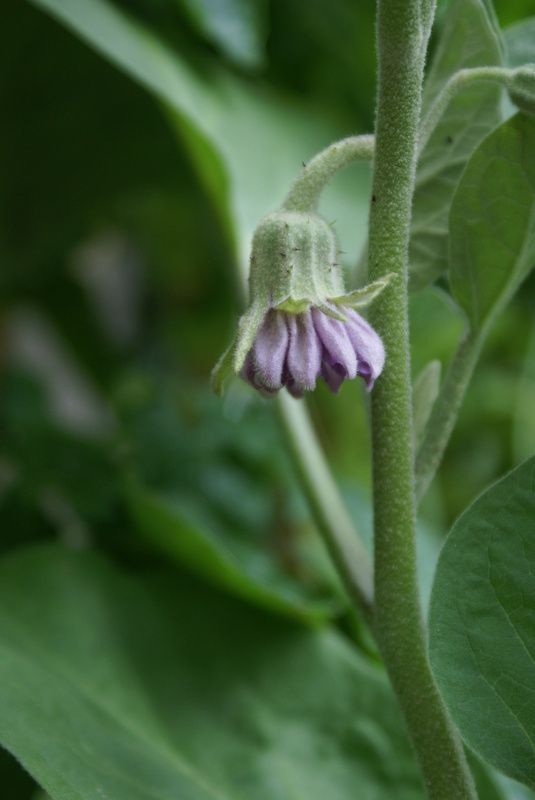 My eggplant also has a few more beautiful purple buds growing now. I had to get a stick and prop the plant up because the large leaves and new buds were causing it to fall over. More garden details next week. Y’all enjoy your holiday weekend! Very very cool!! 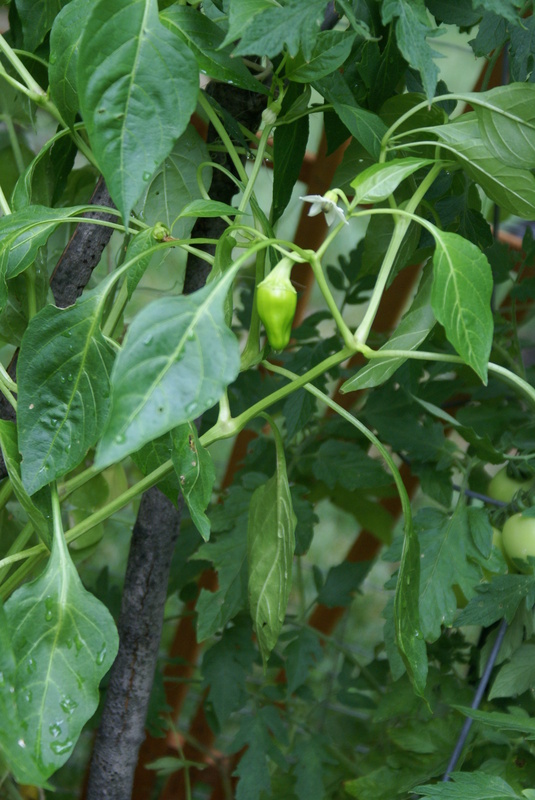 Our tomatoes are stuck green… but our banana peppers are starting to really come in and I’m patiently awaiting the green beans… I have no idea what else my husband planted though!! Have a blessed weekend with your family! I love seeing your garden updates! 🙂 Thanks for the peek. My tomato cages are sticks stuck in the ground and tied together with anything we could find (baling twine mostly). Kind of rinky but it works and it’s free! We had some of our first big tomatoes Friday night….BLTs yummy. Tonight we had fresh corn on the cob and more tomatoes, plus cucumber and cherry/grape tomatoes. Oh my! They are so yummy! Wanted the eggplant recipes and they don’t come up. Even the tail-end of the article is missing.